Don’t get me wrong, I love the 1936 Ford Coupes, Convertibles, Roadsters and Phaeton’s done as full or mild customs very much. 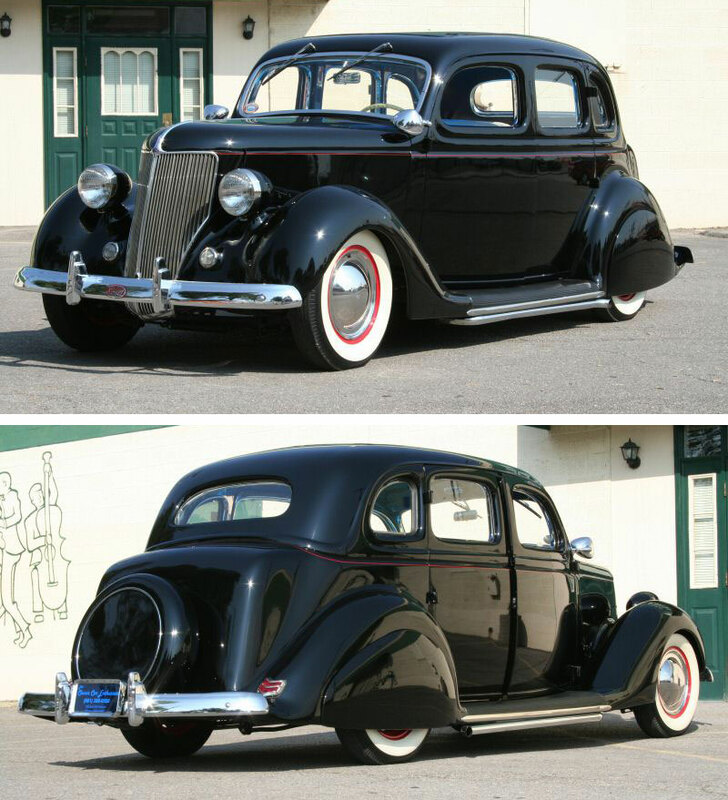 But I also have had a soft spot for the 1936 Ford Sedans done as custom cars. I just love the shape of those long roofs and long side windows. And even the 4-door models look very nice as mild custom, and as we can see in this article as chopped top full customs. The popular body styles of the 1936 Ford have become harder and harder to find, and if you find one, the prices are showing how rare these models are becoming. I have seen several sedan’s, both 2- and 4-doors getting converted to the more desirable coupe and convertible models. At the photo reports of the 2016 GNRS I was pleasantly surprised to see a brand new full custom 1936 Ford based on an 2-door sedan model. And it looked really great. 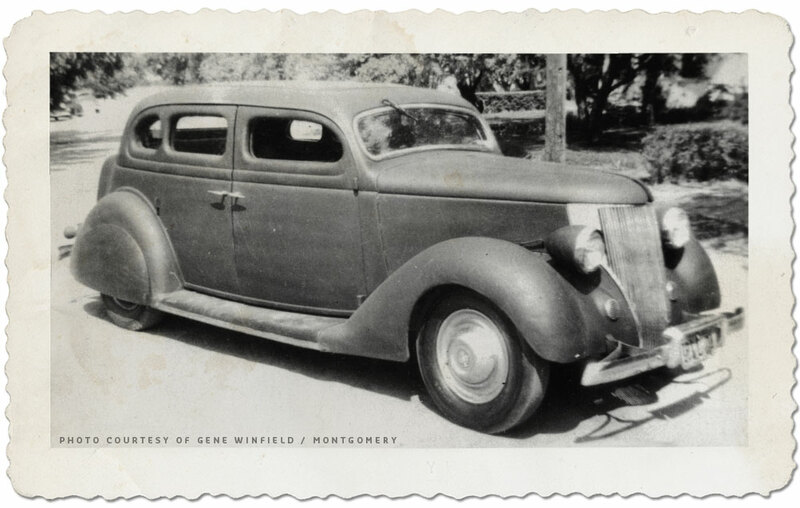 At the end of this article I have included several photos of this ’36 Ford sedan custom owned by Tattoo artist Britton McFetridge. 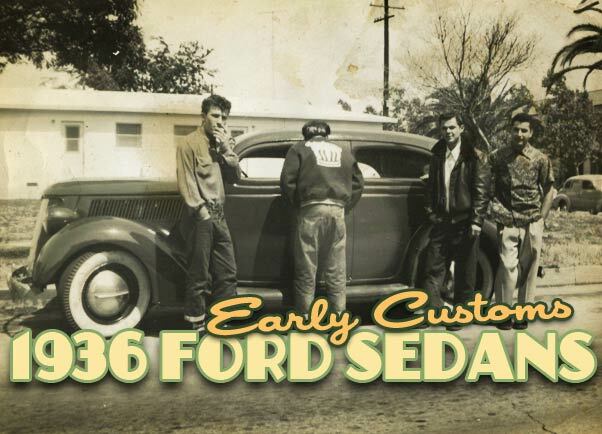 But first lets take a look at the history of the 1936 Ford Sedan as Custom Car. 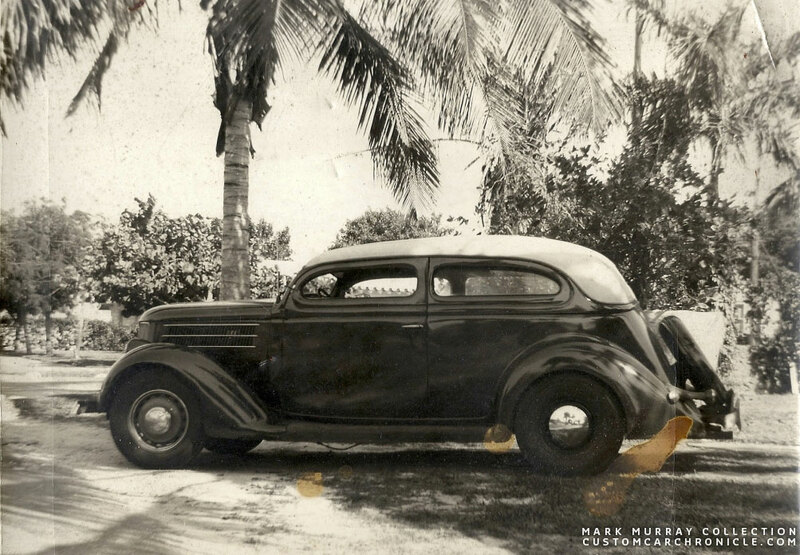 Mark Murray shared a series of really great photos of a 1936 Ford Sedan from his grandfathers photo albums. 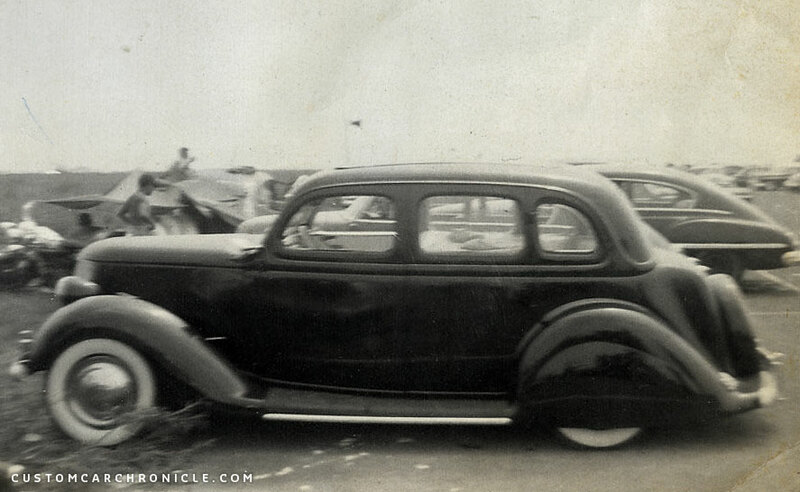 There is not much info known about this heavy chopped sedan, but Mark always heard his grandfather say that this one might have been the first 1936 Ford sedan to be chopped. This side profile shows how much the top was chopped. It appears that the early version might have had a padded top section. 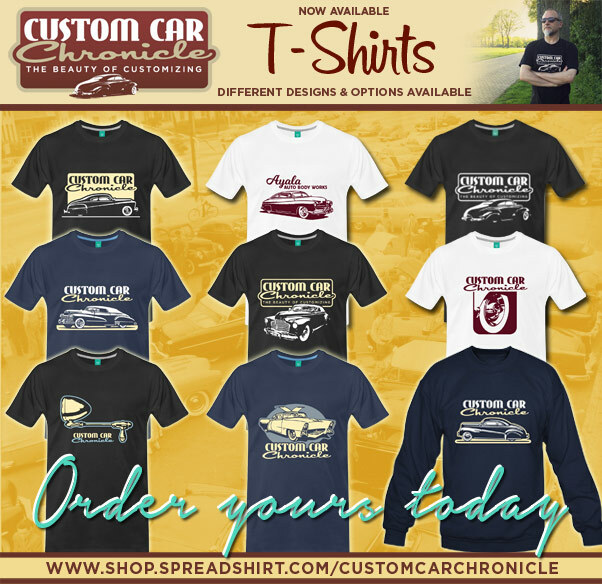 Today the price difference between a 1936 Ford coupe, roadster or a sedan is significant, this difference was also there in the 1940’s and 1950’s. Perhaps not as extreme, but for a young kid trying to get his first car to customize it was cheaper to find a sedan than the other body styles. These Sedans, the 2 doors were more popular than the 4 doors, especially when you wanted to customize them, were quite popular. They had the advantage of being cheaper, but also to haul a bunch of friends. Coupes usually had comfortable place for two, but with the sedans you could take at least three passenger, more fun. 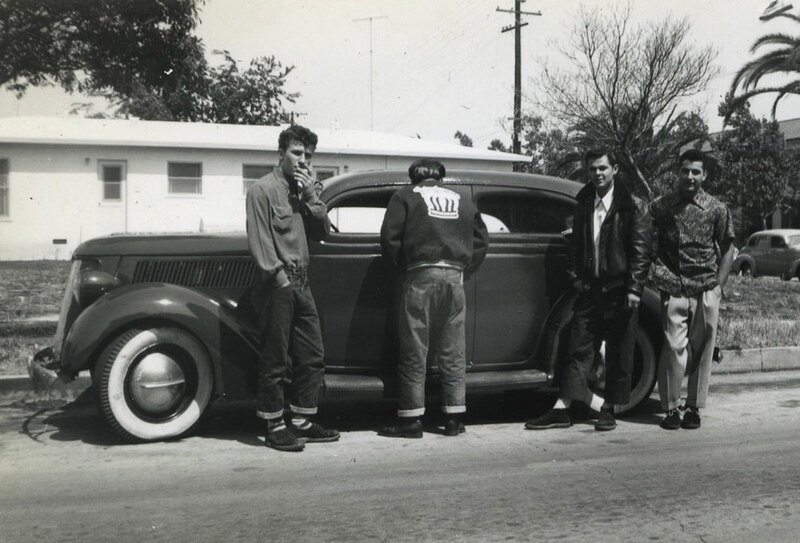 Most of the times these early customs started out as every day drivers. The owners would dress them up with parts for the local junk-yard, and some aftermarket parts like the fender skirts, spotlights, hubcaps, and smooth hood sides. A lot of these early customs had little of no real body work done to them. With the aftermarket parts and the junk-yard update parts, lowered suspension these cars became very attractive. Some of these sedans looked so good that at one point the owner decided to update them further with a chopped top, grille swap, sunken headlights, molded splash pans etc. Some time later in the 1940’s the car was updated with a new filled in roof, and the padding was removed. The stock grille was removed and replaced with an aftermarket Pines Winter-grille to which custom made horizontal bars were added. This front 3/4 view shows how mean the heavy chopped sedan looked. When the top was chopped it was lengthened to make sure all the pillars still lined up. Theroof insert was filled in and it looks like the rear window was not only chopped, but also narrowed. The wheels had a set of Calnevar Doll-Ups whitesides added. Those are large white painted beauty rings to mimic the effect of a white wall tire. These were particular popular in the mid 1940’s where white wall tires were hard to get. Later the sedan was repainted black, and a set of Lyon aftermarket hubcaps where mounts. The front bumper appears to be 1946 Chevy. A later photo shows again different hubcaps and with a set of bumper guards added to the front bumper. 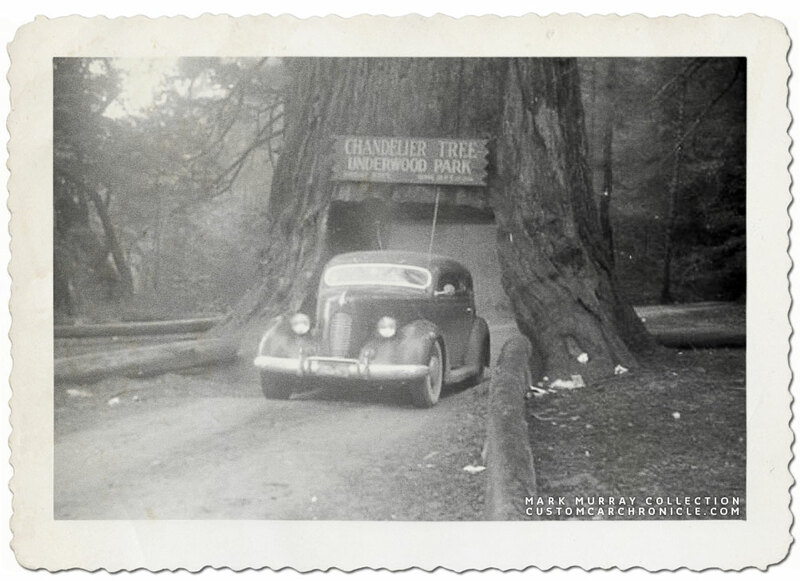 The car was used for daily transportation, including vacation trips. Who said 1936 Ford sedans don’t make cool Custom Cars? 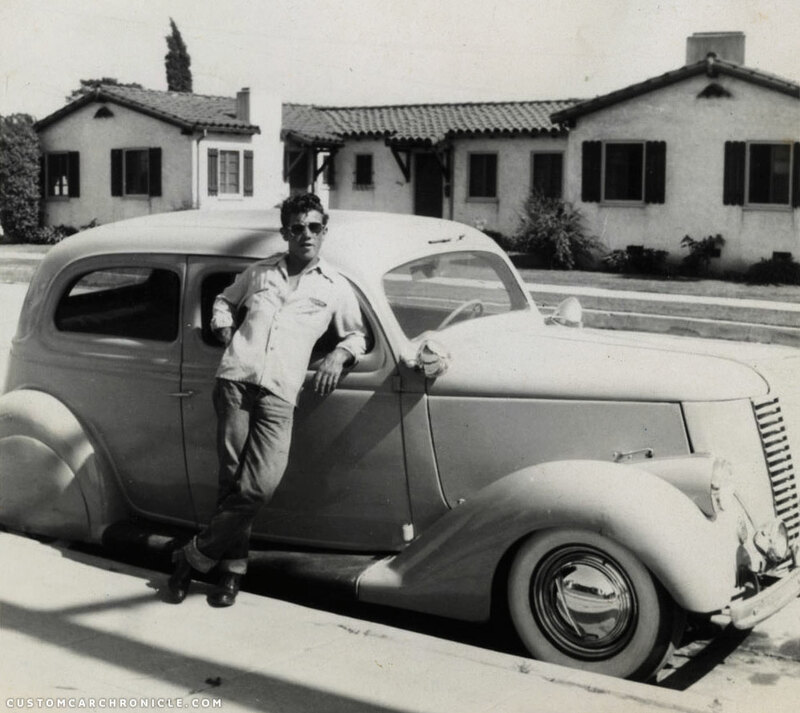 Great photo of this cool guy and his 1936 Ford sedan Custom. Most of the Customizing are bolt-ons, but they were all done nice and tastefully. 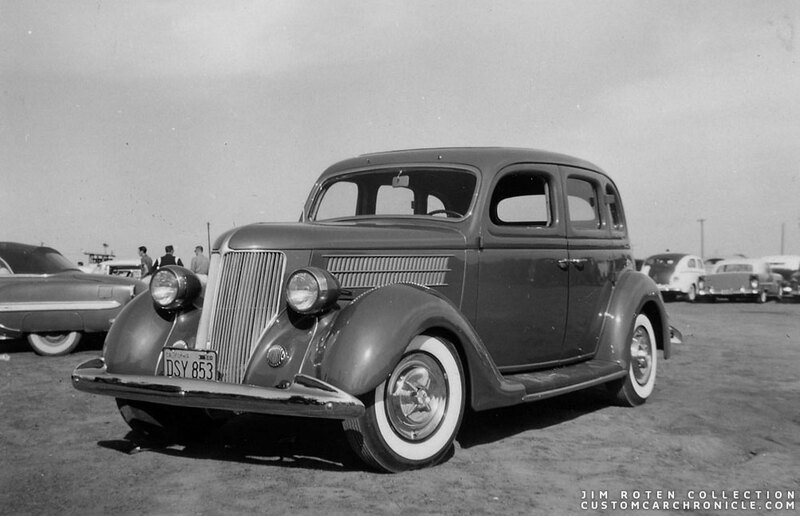 The stock grille was replace with a new metal shaped unit to which a 1939-40 Nash grille was added. Solid hood sides and 1940 Chevy headlights were added. 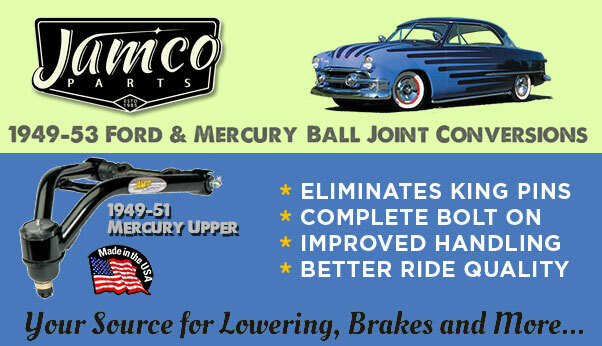 Appleton spotlights and teardrop shaped fender skirts are a must for a cool 1936 Ford Custom. The car rides on wide whites and ripple disk single bar flipper hubcaps and 1941 Ford bumpers with fog lights mounted on the front units. 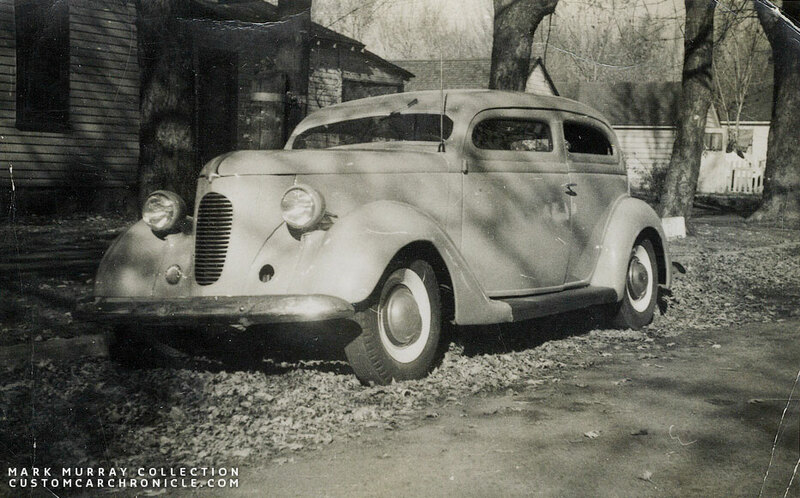 Typical photo of a Street Custom 1936 Ford Sedan from 1945. Lowered, skirted, spotlights added, flipper hubcaps and updated with bumpers from a 1940 Mercury. Bill Gaylord’s personal ride in the 1940’s was this nicely done1936 Ford 4-door sedan. Bill updated it with ’37 DeSoto bumpers, smooth hood sides, flipper hubcaps and beauty rings on black wall tires, twin antenna’s and dual spotlights. I wish we had more photos of this nicely chopped 1936 Ford 2-door sedan to show. 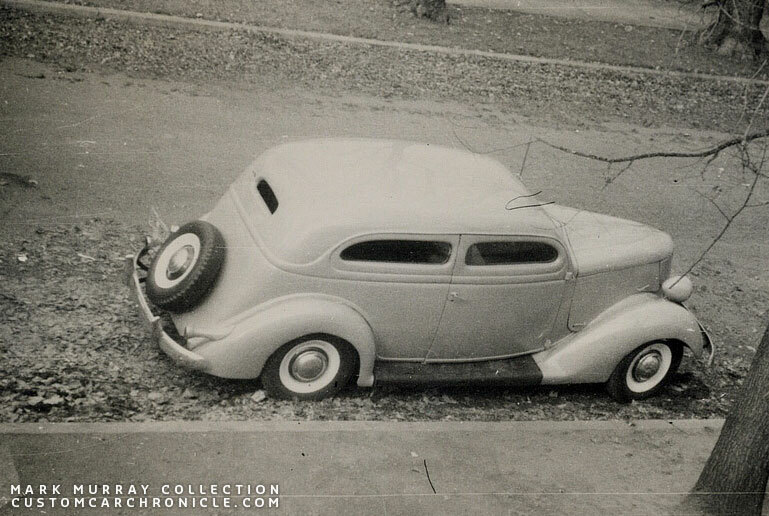 It appears to be perfectly balanced with a really nice chop, lowering, later model Ford bumpers and single bar flipper hubcaps and white wall tires in the mid 1940’s. The guys in the photo make this one really special, but it would have been nice if there was a second photo showing only the car, so that we could see the nice chopped top profile… perhaps one day it will surface. Another, very nicely done chopped 936 Ford 2-door sedan was one owned by Ramblers of Long Beach club member Eddie Hemry in 1949. Eddie had traded his 1940 Ford coupe for this chopped sedan in 1949 originally owned by Bobby DeMarco. After Ed sold it a few years later he never saw it back. 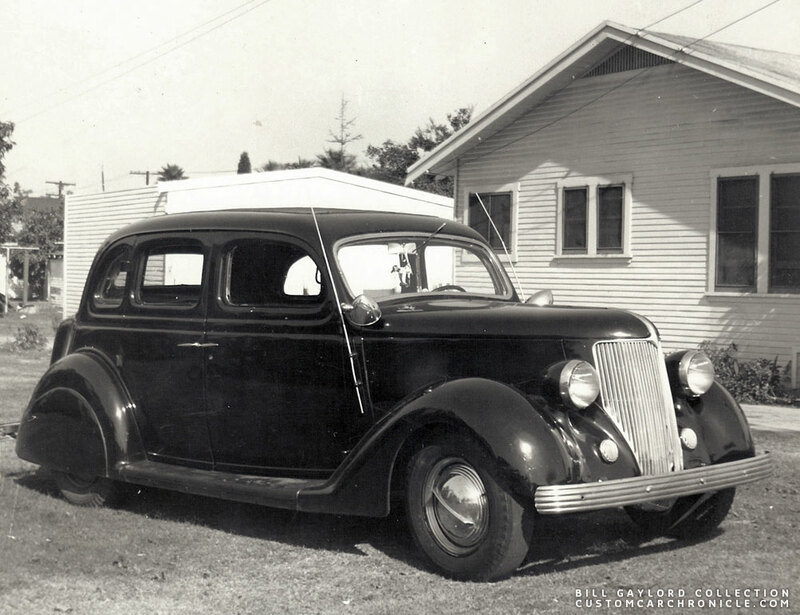 It was rather common to see mildly restyled 1936 Ford 2 and 4-door sedan’s back in the 1940’s, but it was rather rare to see a heavy chopped four door. This one as photographed by Gene Winfield around 1949. The car was beautifully chopped, lowered, skirted and dressed up with aftermarket Sombrero hubcaps. 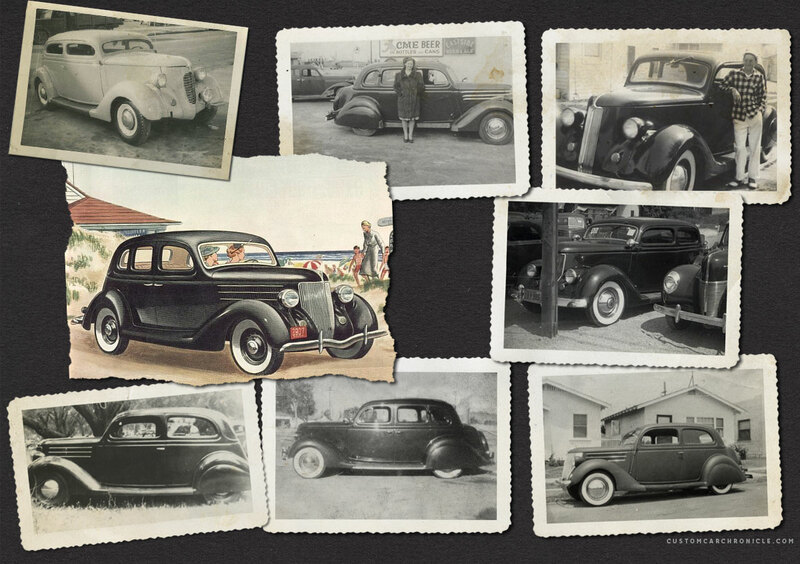 A few more samples of 1936 Ford sedan customs from the 1940’s. 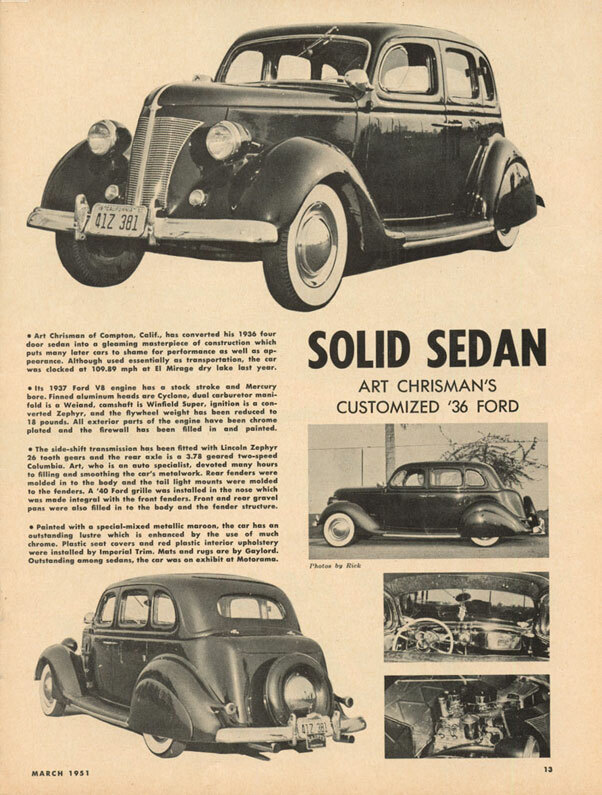 Well known Art Chrisman customized his 19364-door sedan in the late 1940’s and used a 1940 Ford grille, 1948 Ford bumpers and a molded in splash pan for his daily driven cruiser. He made it into the March 1951 issue of Hot Rod magazine with the ’36. 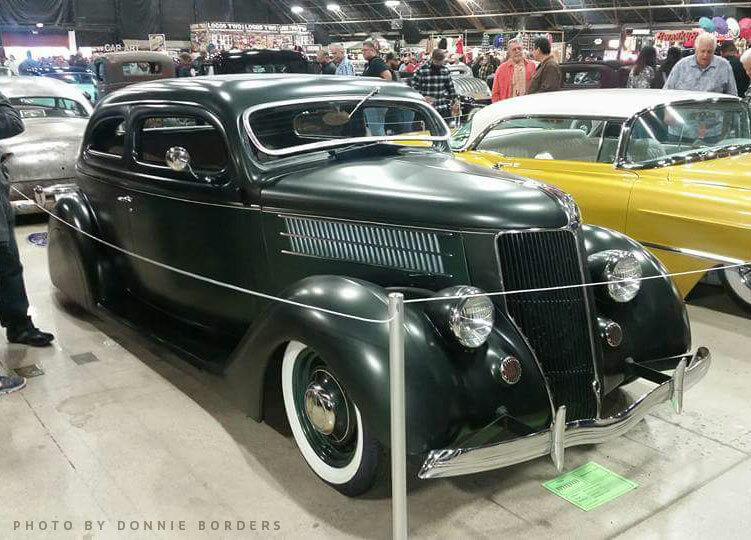 Jack Cooper’s 1936 Ford was created in 1950 and was entered in the first Detroit Autorama in 1951. Beautiful mild restyled with molded splash-pan, 1948 Ford bumpers, smooth hood-sides and a spectacular (for 1951) plexiglass roof insert. Jack Cooper’s Ford at the Detroit Autorama. 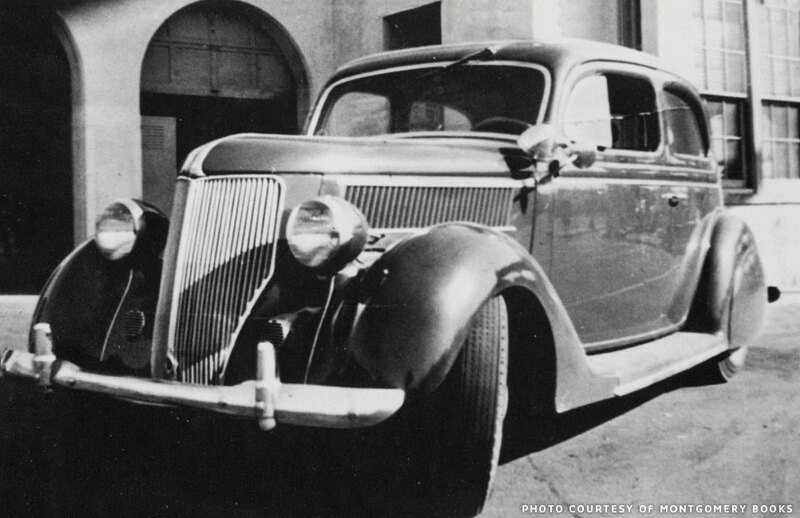 The great thing is that Jack Cooper’s old 1936 Ford 4-door sedan custom is still around today. Now completely restored. Somewhere along the line a set of lake pipes was added, I think it looked better in the early version without the pipes. Jim Roten photographed this nice 1936 4-door around 1957 at a local (Chico California area) drag-strip parking. 1940 Oldsmobile bumpers, wide white wall tires and four bar lancer hubcaps are not the most usual combination, but in this case it works well. 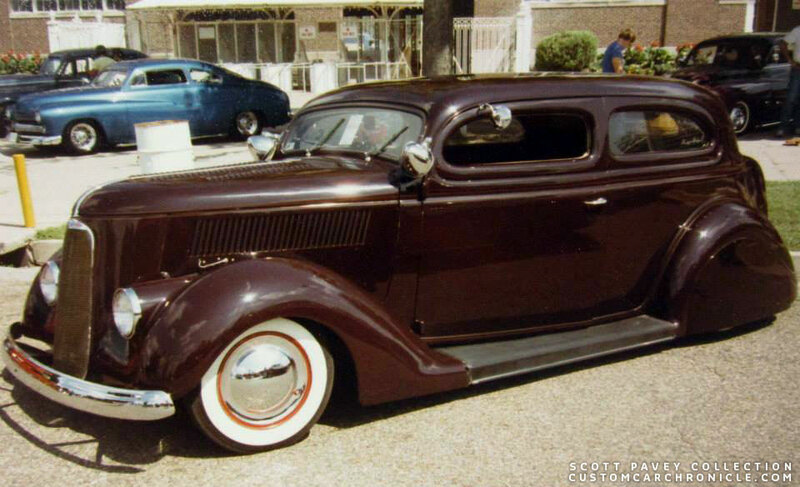 Butch Tucker from Mesa, Arizona had Ken Gartman transfor his 1936 Ford humpback sedan to his dream custom. The car was based on a Dave Bell illustration, who was inspired by Harry Westergard. The car was chopped 4 inches, used Chevy headlights molded to the front fenders and was finished in 1984. It was a big hit wherever it went. 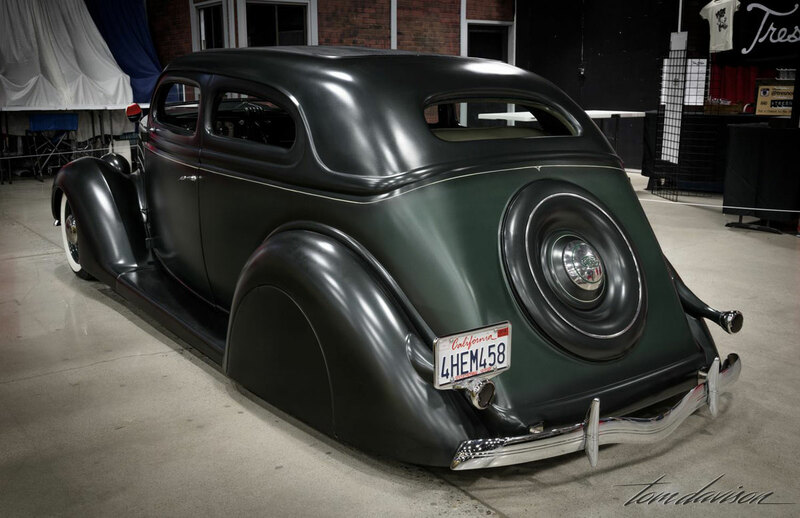 A recently created 1936 Ford Sedan custom is one that the late Bo Huff created for himself. Nice body work with molded in plash pan’s, sunken Chevy headlighs, Olsmobile bumpers and flush fit skirts, make this an very nice cruiser. One of my personal favorite cars at the 2016 GNRS was a 1936 Ford sedan owned by Britton McFetridge. 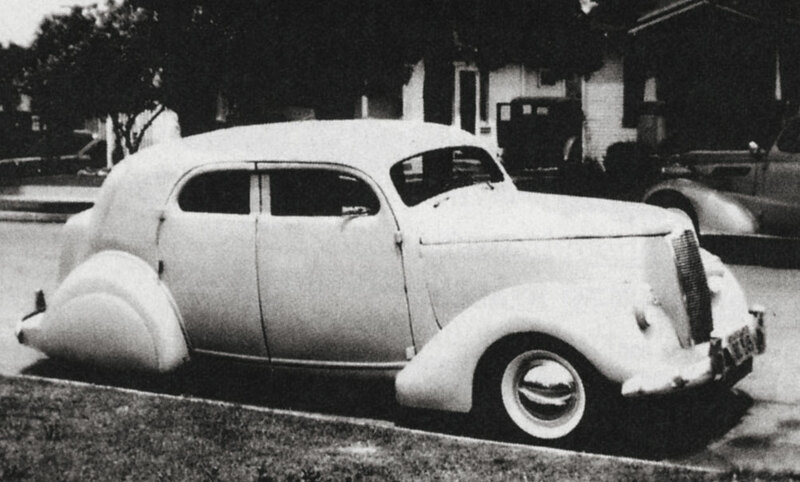 The car was based on humpback sedan Britton had inherited from his father. 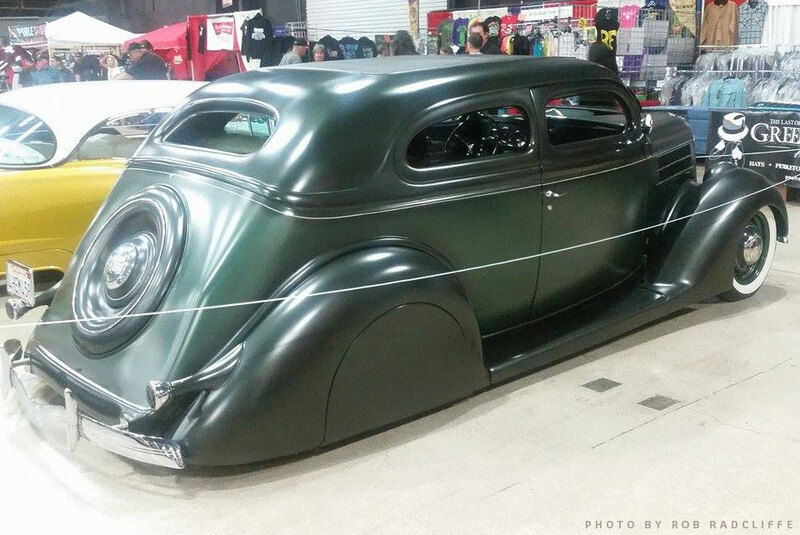 Phil Cannon from Sacramento was responsible for the custom body work on this interesting 1936 Ford. Britton did not care much for the trunk section on the humpback sedan, so that was removed and the spare tire cover was recessed in the new smooth and angled forward rear of the car. One thing that makes this sedan really stand out is that when the top was chopped, slightly more in the rear than the front, it was not lengthened, like most others of this type are. Instead it was decided to lean the whole rear of the car forward, and especially the the back of the top above the beltline to meet with the lowered top. This created a new very interesting line on this 1936 Ford, nice and streamlined. A few in progress photos show how much work had to be done to make the top flow this nice. The reshaped trunk with recessed spare tire cover and slight angle chopped top create some very nice lines on this sedan. Even though the car is bagged in the rear it has a really nice 1940’s vibe that I really like. This profile photo shows the nice flowing lines of the chop with slightly more taken out of the rear than the front. The rear of the body was angled forward and the rear of the top, above the belt-line angled and reshaped to meet the new lower, therefor shorter top. All these body modifications made this body flow really nice. Tom Davison captured the great forward angle of the rear of the car. The headlights on Britton’s Ford Sedan were dropped and molded into the front fenders, nice tough. Handmade flush fit skirts were created. The set in spare tire cover gives the car a really unique, almost coachbuilt feel to it. 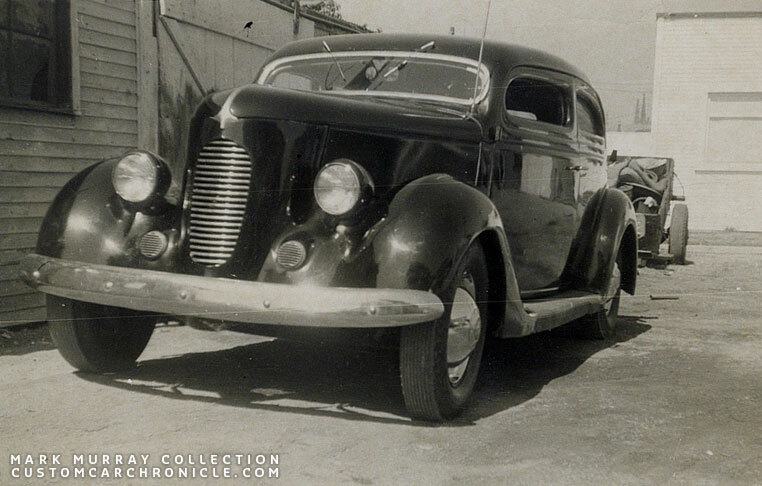 I hope that this CCC-Article about vintage looking 1936 Ford Sedans as custom might inspire more people to use these great looking sedans as customs. They look especially great as 1940’s styled custom cars. Both the 2 and 4 doors work very well, but the 2-door sedans have the best options I think. And Britton’s sedan with angle chop has shows that these sedans can look extremely sleek with the right body modifications. The perfect family cruiser in 1940’s style. Another great, thought-provoking articke, Rik. Its fun to see the evolution in thinking, styles, looking back. And Britton McFettridge’s sedan certainly deserves to be hightlighted from the 2016 GNRS. Our early release CCC photos that people generously shared gave us tantalizing peaks at this car. Then our sleuth Rik put together this fascinating story on its build. This CCC just keeps getting better! Thanks Rik. I agree with Larry Pointer…Great to see people thinking of how many different ways the roof can change the whole look of a car, Also great that sedans were used as customs. I price has really made it hard to source that roadster and coupe and I hope we see more sedans at shows….. I have a feeling after articles like this we will see 2 door sedans go up in price because people will turn to them for cost effect custom for the whole family……..
Hope to see an article on 4 door phaetons…….. As customs.